Need help making an online pledge? Click here for instructions to walk you through the process. Thank you to everyone who has made a pledge and gift! For those considering it, there’s still time to help us reach the goal. Pledge cards are in the narthex or at the Parish Office. Our goal for the projects is $2.4 million. To date, our 618 pledges or gifts received bring us to $2,321,535 million. We’re now within 3% of our goal! If you haven’t made a pledge yet, and are in a position to do so, we pray that you will consider helping us. Pledge cards and information are located in the narthex. You can also donate electronically through Give Central at GiveCentral.org. DOES IT MATTER WHICH ENVELOPE I USE? No. For those ready to make contributions toward your pledge through the collection basket, it’s fine to use either the white envelope that you receive with your contribution statement, or to use the blue envelopes in the monthly envelope packet or located in the back of the church. Either of these is good. If you don’t need the blue envelope provided for convenience in the monthly envelope packet, it is fine to discard it. Our goal for the projects is $2.4 million. We’ve already received 602 pledges or gifts from parish and school families that bring us to $2,273,195 million. We’re within 95% of our goal! If you haven’t made a pledge yet, and are in a position to do so, we pray that you will consider helping us meet our goal. Pledge cards and information are located in the narthex. You can also donate electronically through Give Central at GiveCentral.org. As we look forward to the 2020s, we launched our 2020 Vision Capital Campaign this past summer to tackle some needed projects that demand our attention. Install a fire prevention sprinkling system in the school building so that we are in full compliance with the Village of Hoffman Estates’ ordinance. Improve our School Technology Program. Improve the functionality of our most well-used campus spaces. SOME GOOD NEWS: WE’RE ALMOST THERE! THANKS TO EVERYONE WHO HAS SUPPORTED OUR 2020 VISION! Can I Still Make a Pledge? Yes! Pledge Cards are available in the narthex by the sign with the thermometer, or in the parish office. We’re almost to our goal, so your pledge would be very welcomed and needed. Thank you to all those who have made a pledge and those still considering it. Working together, we’re reaching our goal! No. For those ready to make contributions toward your pledge through the collection basket, it’s fine to use either the white envelope that you receive with your statement, or to use the blue envelopes in the monthly envelope packet. Either one is good. Please note: To complicate matters, our envelope provider did not include the blue envelopes with the December envelopes. They should be back in the monthly packets again in January. What if I Didn’t Receive a Follow Up Letter? For those who pledged indicating you would like to begin making contributions in October or November, you should have received a follow up letter last week. If for some reason you did not receive a letter, please contact our bookkeeper, Lisa Riedl, in the parish office and we will be sure to follow up. Through November 12, please contact Lisa Riedl in the Business Office if you have any questions. Lisa can be reached at 847-885-7700, ext. 110 or at lriedl@sainthubert.org. Thank you to all those who have made a pledge and those still considering it. Working together, we’re reaching our goal! What’s Next After I Pledge? You will receive a thank you letter in the mail, followed by a letter that launches the pledge commitment process—the first of which went out this week. For those not using Give Central, you will receive a letter, a contribution statement and an envelope that you can either drop in the collection basket, mail, or deliver to the parish office. If you are receiving monthly collection envelopes in the mail, you will also receive a specially marked envelope to help assist with fulfilling a pledge. These can also be used for one-time gifts. Thank you to all those who have made a pledge and those still considering it. Working together, we’re almost at our goal! You will receive a thank you letter in the mail, followed by a letter that launches the pledge commitment process. You will receive a form along with an envelope that you can either drop in the collection basket, mail, or deliver to the parish office. Please contact Teresa McCutchan in the Business Office if you have any questions. Teresa can be reached at 847-885-7700, ext. 111 or tmccutchan@sainthubert.org. Thank you again to everyone who made a pledge to the capital campaign, and to many who are still considering it. We are in the process of compiling the pledges from last week and the pledges that are still coming in. We will be able to share an update next weekend. Thank you to Zee and Roger Malinski and Lisa and Jim Elder, our co-chairs for the campaign, and to the host of volunteers who have spent many, many hours of their summer to help us in this effort. It has truly been a labor of love for the parish we love. We are pleased to announce that, as of this wee k, we have raised over 75% of our goal: just over $1.8 million! We are extremely grateful to the hundreds of families who are keeping us focused on the 2020s, so that we are able to keep our buildings safe, functional, and well maintained. What seemed to be an impossible goal, is becoming possible because the burden isn’t left to one person to hold. When we do things together for the good of all, good things happen. Thank you, very sincerely! For those of you who haven’t had an opportunity to complete a pledge, you will have a chance to do so today during Mass. St. Hubert has been a center of Catholic education, faith, hope and charity in the Hoffman Estates and Schaumburg area for almost 60 years. We have benefited from the sacrifices of the families that helped us build our community and get to where we are. Now we are in a period of preserving and maintaining what we have for us, and the next generation, who will carry on the work of the gospel. So, thank you for considering making a pledge or a gift, whatever your decision is. Thank you to those of you, who despite a fixed income and a lot of concern for making ends meet, gave a gift because you wanted to help. Your kindness and love for the people of St. Hubert and those we help mean everything. Thank you to those who responded and said you wanted to help, but just can’t right now for a number of reasons. What’s most important is your presence in our community and your prayer. We need to support each other. As of Monday, October 1, 360 Families and Individuals have brought 2020 VISION Campaign pledge total to: $1,776,004! 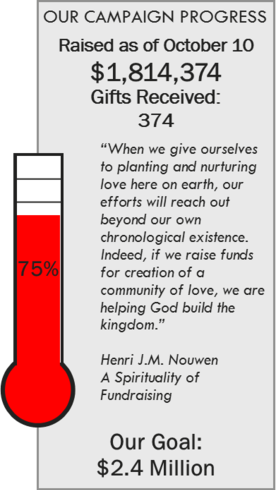 This is 74% of our pledge goal or $623,996 away from campaign goal of $2.4 million! As we continue our 2020 Vision Campaign for St. Hubert Parish, we believe in the future that awaits us – a future we are empowered to do together under the guidance of our God. Having a vision requires looking ahead to see what’s needed. Our faith calls us to proclaim the Good News of the Gospel and to share that good news with others. It’s to bring hope to others, which we do through loving our neighbor. The improvements to our campus, and an investment in Catholic education, will help us continue the work of the gospel in our corner of the world. Our church and school are the result of those who believed in the “future” of our parish years ago. Their vision has been realized in what we have. Our vision now is to treasure it and maintain it for years to come. To have faith in God is al so to have faith in people and in the human spirit. At Mass, when we offer the gifts of bread and wine and our monetary efforts, we are giving back to God the sacrifice of our hard work. We know that God takes what we give and multiplies it. “To Teach Who Christ Is” Our Archdiocesan Assigned Goal: $670,000 over 5 years. St. Hubert to join every parish in the Archdiocese who must participate in this unprecedented campaign. The goal is to teach who Christ is to the next generation and share the gift of our Catholic faith. Next weekend, everyone who has not yet responded to the invitation to participate in our campaign will be invited do so at all Masses during our Campaign Pledge Commitment Weekend. Your response, your generosity, will allow us to address our needs for St. Hubert Parish: School Building fire prevention, School Technology improvements, Parish Ministry Center improvements, Church Lower Level updating and our participation in the Archdiocesan “To Teach Who Christ Is” Campaign. This will allow us to embrace and grow our mission to our parish and the larger community beyond our doors. Thanks to the tremendous generosity of 324 families and individuals. As of September 19, our campaign has now reached $1,682,318 in pledges and gifts! Thank you! Your support is a real witness of what we can accomplish together! Founded in 1961, St. Hubert Catholic School has been noted for our strong educational program. The U.S. Department of Education has recognized us as a National Blue-Ribbon School of Excellence. As we work to transform and enhance the way students learn and communicate, and to keep our school vibrant, our goal is to provide access to digital content and tools via a 1:1 computer device program through a three-phase process. This will equip every student with what they need to learn and develop important skills to do their best in high school, college, and beyond. Fr. Mike and the 2020 Vision Leadership Committee invite all members of St. Hubert Parish to consider making a pledge to the campaign. Please prayerfully consider the gift and make your pledge in the coming week. Pledge cards are in the mail. If you need information or have not yet been contacted by a volunteer, please call the parish office at 847-885-7700. I’ve Made My Pledge – Now What? Once you’ve made a pledge and submitted it to the parish office, the pledge information is entered in the confidential parish tracking database. Shortly afterward you will receive a thank you letter from Fr. Mike. Following this, pledge payment reminders will be mailed to you beginning late October confirming the pledge fulfillment option you requested on your pledge card. All donors will receive the first payment reminder mailing to insure information entered is correct and accurate. If you would prefer to make payments online, we are using Give Central. Information on how to fulfill the pledge will be mailed to you in October. You can also contact the parish business office at 847-885-7700. Of course, if you like, you can make a pledge payment anytime. Simply make your check out to “St. Hubert Campaign” and place it in an envelope marked “Campaign”. You can drop in the collection basket or mail it directly to St. Hubert Parish. Thank you to everyone who has made a pledge, and for all of you who are prayerfully considering it. Through your generosity, we are able to continue to help bring faith, hope and charity into the lives of those who believe. Each week we will feature one of the areas our campaign seeks to address. This week we look at the third of the five main areas of need. St. Hubert hosts a variety of community outreach programs, parish life events, and ministries in the lower level of our church. Next to the Parish Ministry Center, it is the most used space on the campus. A new electrical panel is needed for the kitchen, which will help us when hosting families for lunch after funerals, and we would like explore adding zone lighting to better accommodate parish social events. Prior to this campaign, we did not have a sound system, which made it difficult to hear when large groups are gathered—especially families gathering to remember loved ones and share memories at our funeral luncheons. Since the campaign began, a parishioner in the sound business generously installed a new system for us, so we have already completed that part of the project and just used it for the first time for a large funeral luncheon. The family was grateful, as are all of us, for this generous in-kind gift. Have You Responded to Fr. Mike’s Request Yet? Fr. Mike and our Campaign Leadership Team invite you to consider making a pledge to the campaign. Please prayerfully consider it and make your pledge in the coming week. If you need information ,or have not yet been contacted by a volunteer, please call the parish office at 847-885-7700. Once your pledge information is entered in the confidential parish tracking database, you will receive a thank you letter from Fr. Mike. With regard to making pledge payments, pledge payment reminders will be mailed to you beginning in October as you had requested on your pledge card. All donors will receive the first payment reminder mailing to insure information entered is correct and accurate. If you would prefer to make payments online through the parish Give Central format, you can do so. Information will be mailed to you in October. You can also contact the parish business office at 847-885-7700. Of course, if you like, you can make a pledge payment anytime. Simply make your check out to “St. Hubert Campaign” and place in an envelope marked “Campaign” and drop in the collection basket or mail it directly to St. Hubert Parish. What an exciting time for our parish the opportunity to look toward and prepare for our future! Last week at all Masses our Campaign Chairs gave us an update on the campaign which placed our amount raised to date at $1,530,513 pledged from 267 families and individuals. We have a large parish and have not yet heard from many. Fr. Mike and all who are working on the campaign are praying that the Holy Spirit guide you as you make your decision and response. When the Parish Ministry Center was completed, it greatly enhanced our parish campus. It is the center of activity with daily activities year-round. The building is a gathering place and over time we realized a strong need to reconfigure the electrical system. This will allow us to better host large events which is currently hard to do. There is also a need to create a better functioning front desk area to welcome parishioners as they enter our building and to safely store our sacramental records. Fr. Mike invites all members of St. Hubert Parish to consider his gift request and make a pledge to the campaign. Please prayerfully consider his gift request and make your pledge in the coming week. If you need information or have not yet been contacted by a volunteer, please call the parish office at 847-885-7700. Keep an eye on the Campaign Gauge and watch the giving thermometer continue its rise to our campaign goal of $2.4 million. As of the weekend of August 25 & 26, we had just tipped over the half-way point! Thank you to our first 135 families and individuals who have offered us encouragement to reach our goal, but even more so, help St. Hubert address specific needs. As a parish family we look to the future and the importance of continuing to care for our campus as we do our own homes. Through much study and prayer, our parish leadership created a plan to maintain and preserve all that we’ve built, renovated, and invested in over the years. Reaching the campaign goal will help us keep our buildings efficient, up to code, and functional. They will help us keep our school current with technology and allow us to support the larger Church through our participation in the Archdiocese of Chicago To Teach Who Christ Is campaign, which supports the desire for Catholic Education in Cook and Lake Counties. The Village of Hoffman Estates has directed that we install a fire prevention sprinkler system in our school building to comply with its ordinance. While the school itself is already exceptionally safe, this mandate will allow us to meet the building code required of all Village school buildings and will make our campus that much safer for everyone, including firefighters. Along with the continued safety enhancements, this project will also allow us to install new light fixtures to improve the facility. The lighting in the primary school is original to its construction in 1961. Volunteers are reaching out through telephone calls to parish families who have yet to make a decision to support our campaign. Our volunteers are people sitting in the pews with us who care about our community and want to help. Please welcome their calls and say hello. They are there to help answer questions and to lead you through the process. They will respect any decision you make. They are also available to take any requests for prayer, or to connect you with a program or ministry that serves all of us should you need it. If you are ready to make a pledge, but haven’t connected with one of our volunteers, please feel free to give us a ring instead. Please contact our campaign office at 847-885-7700, ext. 112. To all of you who already pledged, or are in the process of considering a pledge, thank you! We have the vision to accomplish what’s ahead. We do it for our community, the parish where we belong and find life. As St. Paul said to the community in Philipi: “Your kindness should be known to all.” (Phil 4:5). May God bless St. Hubert Parish. Q. I would like to make a pledge, but our budget is especially tight this year. How can I still participate? A. The campaign pledge period is structured over a five-year period, and you can determine when you want to start payment of your pledge. Q. We have been transferred to this area and will probably move in a few years. Why should we contribute to a campaign that will not directly benefit our family? A. More than likely, you have been the beneficiaries of facilities or Catholic education in this parish as well as in others. When you move and join another parish, you will benefit from the generosity of others in your new parish. Q. Will I need to maintain my weekly contribution? A. Yes! Weekly offerings are used for the normal operating expenses of the parish. We depend on these contributions to maintain the parish and its programs. Q. Can I make a gift other than cash? A. Yes! A range of attractive possibilities exists, including appreciated stock, real estate, bequests, etc. Please contact your financial advisor or Teresa McCutchan in the parish office for further information. Q. What if my financial situation changes and I am not able to fulfill my pledge? A. Your pledge to support the campaign is made in good faith. Should financial difficulty arise, making it impossible for you to continue your payments, please notify the parish office. Volunteers are reaching out to all parishioners through phone calls and personal visits on behalf of Fr. Mike to answer questions about the campaign and ask for your support (a pledge.) Please be generous and help us address these extraordinary needs and provide necessary infrastructure projects and updating. Like our homes we must take care of our parish buildings as they are our spiritual home. A. All parishioners are being asked to consider a specific gift amount. However, you alone can determine the amount of your gift. Consult the various gift plans accompanying the campaign brochure. Please remember, we need the participation of all parishioners and, if your gift is one of sacrifice, it is truly a generous gift regardless of its size. Q. Why am I asked to consider a specific amount? A. Parishioners need to know what levels of support are necessary to meet and exceed our campaign financial need. A gift amount is suggested for each household to prayerfully consider. No judgment is made on the level of gift you or others make. The true test of your gift is whether it is planned, proportionate and sacrificial. Q. What if I choose not to give the amount requested? A. Matters of giving are questions of priorities. Your family is unique unto itself; however, you are asked to prayerfully consider a specific gift. Whatever your response, it should be one of choice and sacrifice. Q. I dislike pledging. Why am I asked to make a pledge instead of a one-time gift? A. You can make a one-time gift; however, the success of the campaign rests largely on pledges payable over five years. In addition, by making a pledge, you are able to donate more than would be otherwise possible with a one-time gift. Campaign volunteers are visiting households to seek parish-wide support for our 2020 VISION campaign. These families have generously given of their time, talent and treasure to help provide for the current and future generations of parishioners. When a volunteer calls on you, please take time to consider your own gift to the 2020 VISION campaign and welcome them with kindness and good will. Many Thanks To Our Wonderful Team of Campaign Volunteers. Many more volunteers are still needed to help make our campaign a success! When you are asked, please say yes and join with these folks that are helping so far. The weekend we kicked-off our parish campaign with an announcement made by Fr. Mike at all the Masses. This announcement explains the why behind the needs our campaign seeks to address and the plans we’ve developed. Our campaign, 2020 Vision, seeks to raise $2.4 million which will enable us to address some practical needs as we head into the 2020s. We are pressed to address a directive from the Village of Hoffman Estates to install a sprinkler system in our school building so that we remain compliant with the village’s ordinances. (The building is also used for Religious Education, our GIFT Program for those with special needs, Scouting, and for different social gatherings.) We also have begun an initiative that will bring technology into the hands of our school children to keep up with the latest trends in education. We are also planning some modest updating and improvements to two other very used meeting places on our campus: the lower level of the church and parish ministry center. And, along with every other parish in the Archdiocese, we are participating in the Archdiocesan “To Teach Who Christ Is” campaign, which benefits those receiving a Catholic education—both in Catholic Schools and in Religious Education Programs. As you can see, we have a tremendous committee of parishioners who are serving as the leaders for our campaign. We offer them a big thank you for their ongoing work to bring our campaign to a successful conclusion. Next Sunday, we’ll be launching our capital campaign that we are calling our 2020 Vision. Check your mailbox this week for a letter introducing the campaign and for some background information. This campaign identifies the needs that will help our parish keep doing the good things we do as we head into the 2020’s. our obligation as a parish (and every parish) to participate in the Archdiocese of Chicago’s “To Teach Who Christ Is” campaign which supports Catholic education. We’ve begun organizing and planning for this capital campaign, which we are simply calling our 2020 Vision. We are in the initial phase and will share more on the weekend of August 11 and 12 when we publically launch the campaign. St. Hubert has always been a parish that empowers us to live the gospel by building up the community who use our facilities to gather, minister and fulfill the mission of the Church. The campaign will help us continue our presence as a center of faith, hope and charity as we move into the 2020’s. Click here to view the Executive Summary of the feedback we received about our proposal for a capital campaign. Thank you to everyone who completed surveys and for those who came in for an interview to talk more in depth about the proposal. Your input was and continues to be valuable and needed. We are continuing with our campaign planning process and are creating a leadership team (made up of parishioners like you) who will help take us to the next step. Please continue to pray for all we’re trying to accomplish to help keep St. Hubert focused on the work of bringing the gospel into the world. Last month we completed surveys about the capital campaign we’ve proposed to help move us into the 2020s. In addition to the surveys, we also conducted some one-on-one interviews with parishioners to dig a little bit deeper and to learn what’s feasible. This week we received a report compiling the research. Our parish leadership teams—the Parish Staff, the Parish Council, Finance Council and School Board—are now meeting to talk it through and to determine where we go from here. We will provide an update shortly after Easter Sunday. Thank you again to everyone who provided the feedback we need, so that anchored in prayer and working together, we can do what’s best for all of us. Last week during Mass, I mentioned that, working with the Parish Council and Finance Council, we have realized that this is the year we will need to tackle some expectations that have been placed upon us as being part of the larger Church in the Archdiocese—to participate in the To Teach Who Christ Is campaign—as well as being part of the Village of Hoffman Estates—to install a fire prevention sprinkling system in the school to be in compliance with the village ordinance. But it also compelled us to look at our current campus and identify important functional improvements to some of our buildings. Our buildings are used virtually every day of the year, and it’s where our community building and ministry takes place as we live the gospel. We also felt it was important to include a way to reduce some of the debt we incurred in the church renovation, as well as to help our school students stay current with the trends in education that involve hands-on technology. Click here to view the working plan. We are presenting it so that you can see what’s involved and have some time to think and pray about it. Then next weekend at the Masses, you’ll have a chance to complete a survey. Your insights will help us as we contemplate how to proceed from here. We’re taking it a step at a time. So we’re grateful to you for taking the time to consider the plan and to pray it through. We do this work together, through Christ—with Him and in Him. And that’s what will help us as prepare for the 2020s. “We can do all things through Christ who strengthens us.” (Phil 4:13).